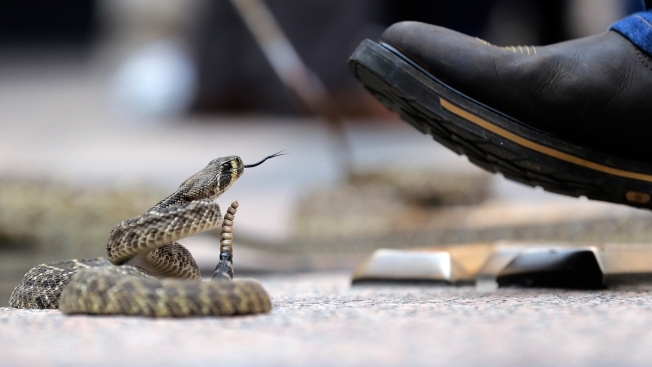 In this file photo, a rattlesnake watches a handler's boot at the Capitol, Monday, Feb. 2, 2015, in Austin, Texas. A South Texas man almost died after he was bitten by the head of a rattlesnake he'd just decapitated, his wife said. The bite happened May 27 as Milo and Jennifer Sutcliffe were doing yard work at their home near Lake Corpus Christi. Jennifer Sutcliffe said her husband found a 4-foot rattlesnake and hacked off its head with a shovel. As he bent down to pick up the remains, the severed head "actually turned around and grabbed onto his hand," Sutcliffe told the Houston Chronicle. "He had to rip it off." Sutcliffe said she called 911 and began driving her husband the 45 miles to a Corpus Christi hospital. He began having seizures, losing his vision and bleeding internally and was airlifted the rest of the way, the report said. "He was saying stuff like 'if I die I love you,'" she told the Chronicle. Sutcliffe said her husband needed 26 doses of antivenom, where a normal patient gets two to four. He was recovering in the hospital.